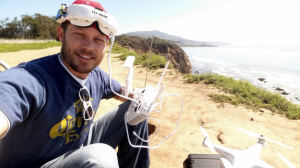 Jonathan Dannenfelser, AKA “Jonathan The Drone Guy,” is an experienced drone pilot residing in the greater Los Angeles area. Jonathan’s passion for flying started at a very young age where he learned how to fly single-engine airplanes before he learned how to drive cars. Many years and many flights have since passed, and Jonathan found himself flying a small remote-controlled helicopter around his son’s baby swing. Jonathan became so good at flying his RC helicopter that he challenged himself to turn his passion for flying into a lucrative business. Jonathan’s passion led him into drones, in which he learned everything from design and building to flying, filming and racing drones. Sure enough, Jonathan The Drone Guy was formed. Jonathan The Drone Guy offers various drone services including aerial photography and aerial videography with a focus on real estate drone photography and drone wedding photography. Jonathan is insured and holds the FAA Section 333 Exemption & Part 107 Operators Certificate. With Jonathan’s expertise, the possibilities with drone photography and videography are virtually endless. From using drones for real estate to drone wedding photography, nothing beats Jonathan’s precision and professionalism. Get in touch with Southern California’s top drone pilot today to learn more!